So, it’s finally here! The Google Plus One! 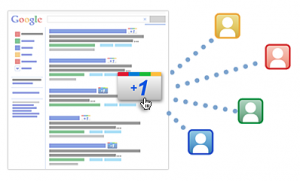 The question is, is this an integration of search and social? Or is this simply a new social layer to search that will offer limited integration, but essentially just a “social layer” as it’s already been labelled? Well I’d be interested in your thoughts, ultimately, coming from a PPC background, anything that may give me more SERP real-estate and help to differentiate me from the competition is good! However, how is this really meant to work? I’ve already read numerous blog posts that identify the “hindsight” approach…. So essentially for this to work, I’m going to need to find and view a site that I like, then either hit back in the browser or re-search the term, re-find the site and then plus 1 it! Or, like we have on this page, can you only plus 1 the site via the button on the page itself? Is it just me or does this sound a bit counter productive? Once I have identified a need, I like to search, fulfill that need and then move on! But I guess with the rise of Social, we can all identify with the urge to talk, tweet, blog, post…. about our experiences, so perhaps, in full social style, this really will become second nature!